Today we’d like to introduce you to Gayle Stephens. Gayle, please share your story with us. How did you get to where you are today? Who lives through wedding planning without stressing out? 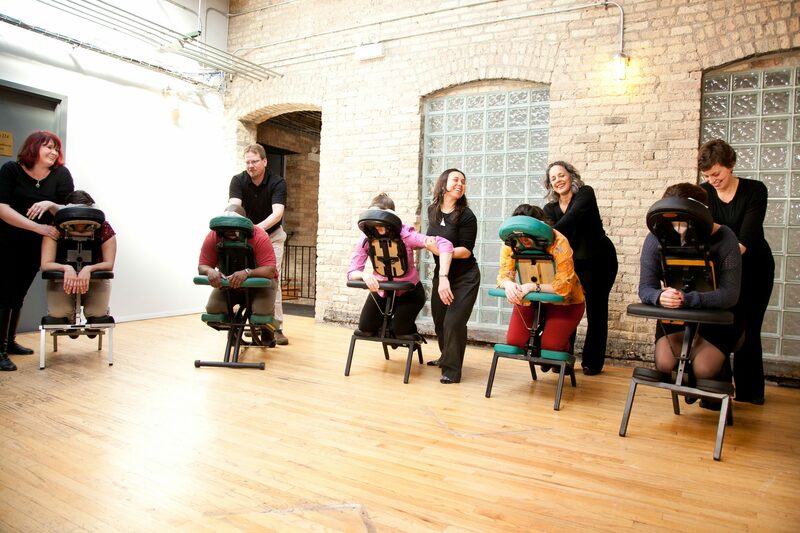 I had my first massage during this period and the experience set my learning in motion. Reading the bio on the door of the practitioner’s part-time YMCA office, one specific aspect captured my attention: a 20-year Tibetan Meditation practice. I found this to be the most eccentric thing. Eccentric and awesome. His fabulous work aligned my lower spine and hip bones in a way that transformed how I moved and felt long after the session. It surprised me how compressing the flat bone at the base of my spine in a certain way could have such a significant effect. I felt lighter and freer when I walked, and emotionally knew that everything would be ok. What I didn’t know then was that I, too, was on a path to finding a Tibetan teacher. This year, along with celebrating 20 years as a bodyworker, I honor 20 years of life-changing teachings from Tibetan Lamas in Kathmandu, and from the Dalai Lama in person and from afar. These teachings have greatly informed me as a therapist and as a person. I have a lineage of significant teachers who led me here, and it started with this first massage. 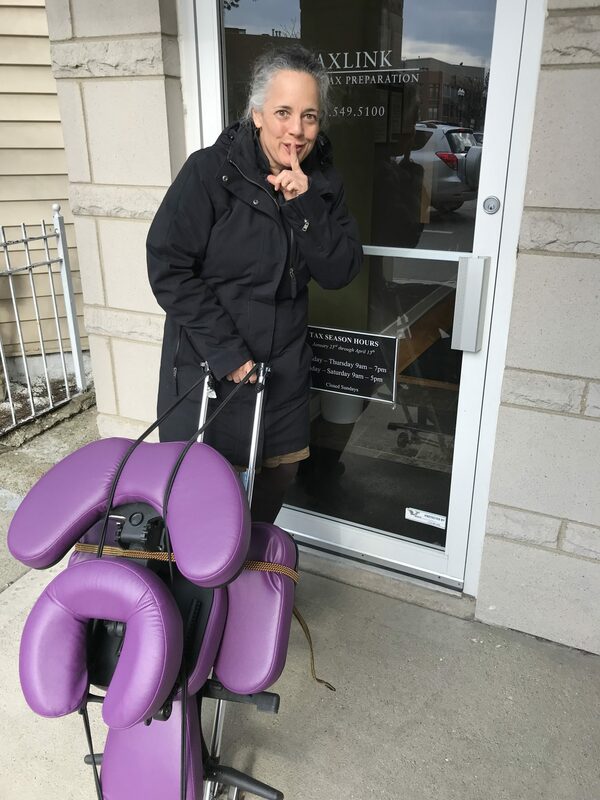 Shortly after that first massage therapy session, I had the joy and blessing of meeting Patricia Deer who offered to teach me how to do a 15 minute Japanese Shiatsu seated chair massage. She taught me, I practiced, and I began working with her company. Over the years since, I have honed my skills and taught others how to help people feel better at work. Today, GayleForce which is myself and nine dedicated and fabulous practitioners continue her legacy of helping to ease suffering. 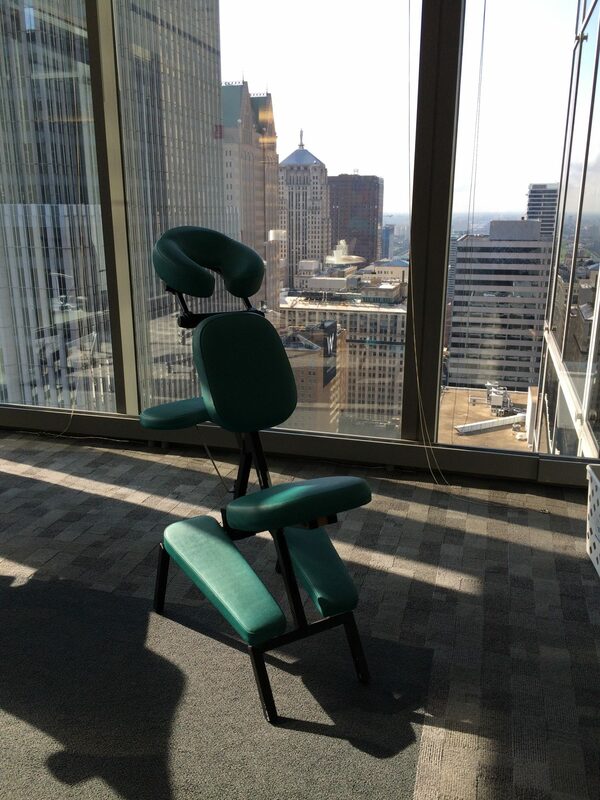 One of the first chair massage gigs I did was for the Asian American Journalists Association (AAJA). I was a nervous wreck! I had learned just one 15-minute Japanese Shiatsu chair massage practice and I was convinced a journalist would sit in my chair, modestly explain an ache and expect immediate relief because, in my mind, the person in the chair would be of significant Shiatsu healer lineage. I worried I’d be discovered as fraud or at least an absolute beginner. Twenty years later, as I train therapists in Japanese Shiatsu, I realize how thankful I am for the early stages of learning of any kind and the generous teachers who not only patiently teach the skills but also how to independently hone those skills over time. I give daily thanks to my many teachers for their deep, patient generosity in trusting me. Certainly, a descendant of Japanese Shiatsu Masters would have been generously patient, even with a beginner. I wasn’t always an entrepreneur, never really thought about becoming one… my passion was touching people. But I grew out of being a sub-contractor fast and transitioned into worked independently. Then, as the number of clients calling on me to do bigger corporate gigs increased, one by one I was able to gather my favorite massage therapists in town and give the people what they wanted. There is only so many people I can touch with my own two hands in a finite time. So, GayleForce evolved. It has been mostly a steady growth except for the last big nationwide recession. 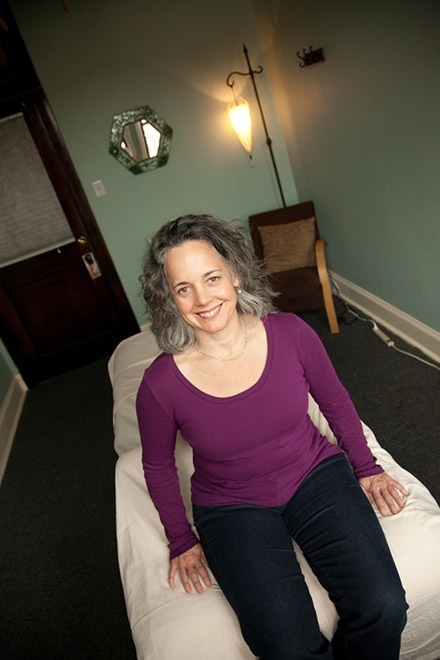 And to be honest, deep dark visceral fears of succeeding only occurred once… for about five minutes during my first year as a massage therapist when I was new and ending a marriage. After those five minutes, I have never looked back. Month to month, there are few disappointments. The uncertainties keep it exciting. All of the successes of GayleForce far outweigh the uncertainties and disappointments. I am a lucky woman, grateful for the joy of doing what I love. For women who are beginning a journey in helping others, truly just do it. Find a mentor, be curious, and always be kind. This goes for any journey, not just the path I chose. 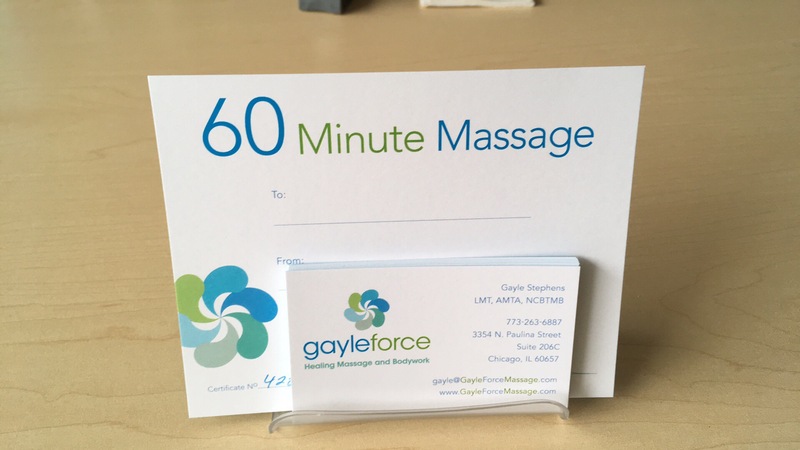 So let’s switch gears a bit and go into GayleForce™ Healing Massage and Bodywork story. Tell us more about the business. I love my job! Healing, giving, helping people experience how good they can feel, building meaningful relationships, improving lives, learning. Touch takes two. Sessions with me are never the same. Every single personality, body, time, season, mood, diet, exercise, posture is different. 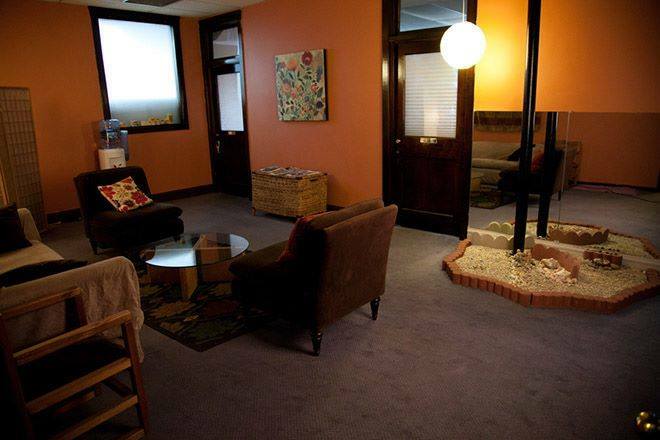 A therapist is never the same person for the same reasons. Early in my career, I worked for several years at a Chicago advertising agency at which one committed client saw me weekly for a half hour. Even after four years, he affirmed no session was ever the same. Every client comes for a different reason: headaches, back ache from pulling weeds or carrying a child, grief, job dissatisfaction, heavy workouts, athletic event prep or recovery, or maybe just because they received a gift certificate. Together we fix the issue and, hopefully, offer goodness that lasts until something changes and together we try something new. 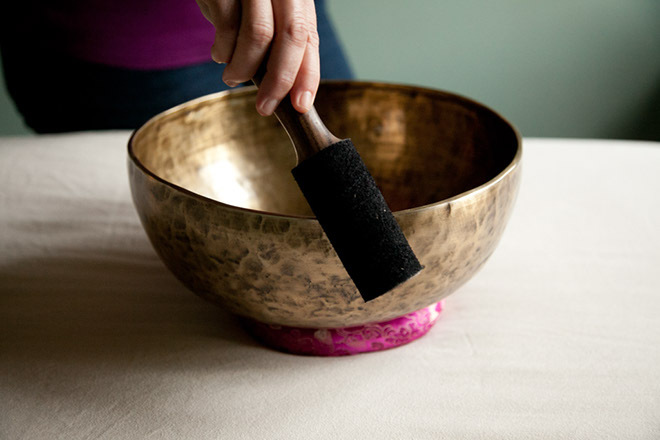 Among the tools I use, massage chair or table, human client, human therapist, gravity, one dear to my heart is a Tibetan Singing bowl. 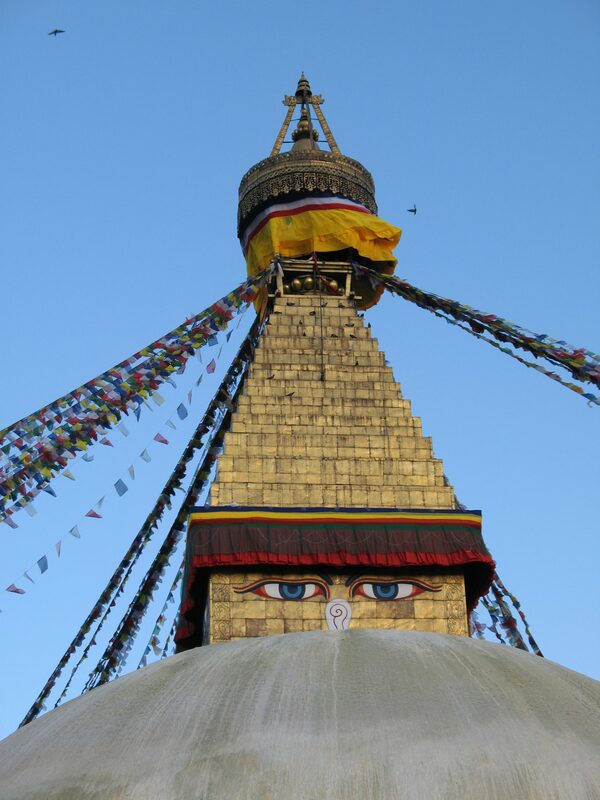 For over ten years, I made an annual pilgrimage to Kathmandu, Nepal to be with my sangha of meditator friends and to learn from my teacher at the monastery of one of her Tibetan teachers. 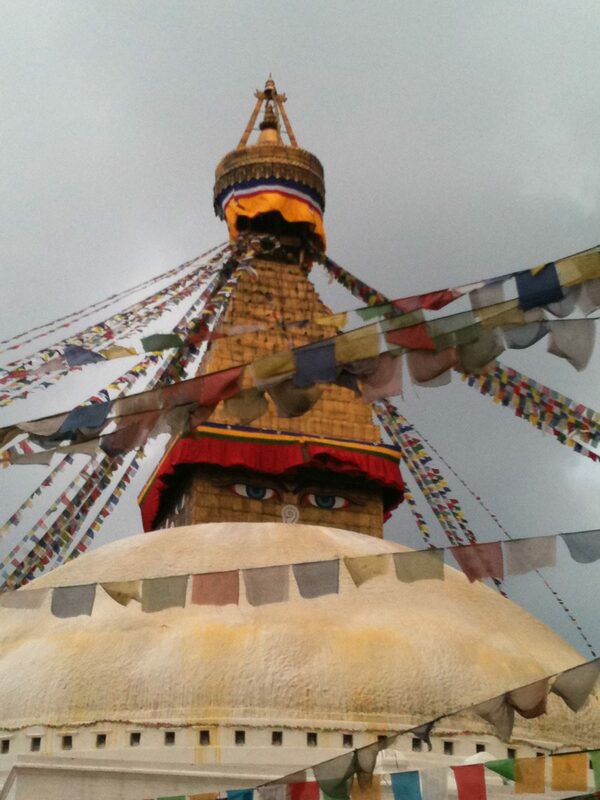 Every year, I looked forward to returning to the compassion and beauty that is Nepal. At the monastery we woke every morning to a gentle, loud gong in the distance signaling the first early morning puja. Incense lit in our courtyard would soon seep into my cozy sleeping room, calling me to rise. The monks scurried around their side of the monastery and began their walking puja around the lakang, singing a mantra of wisdom. Their sweet, high-pitched, young voices seemed to enjoy what would sound like a fun kid’s song. I’d roll out of bed, slower than the monks, dress, and make my way over to the lakang where the monks would gather twice daily. The drone of monks’ voices is lovely, and the feelings that arise, even without hearing English words, would make my heart melt with love and compassion, abundance and joy, and the deepest sense of knowing that I am loved. Also while in Kathmandu it’s easy to enjoy the shopping. Ram, who is a musician and grandson of a famous Nepali musician, is our resident singing bowl guy. Each year he has a new inventory of old and new singing bowls to sell. Although they seem alike at first glance, no two bowls sound the same, are perceived the same, are the same. 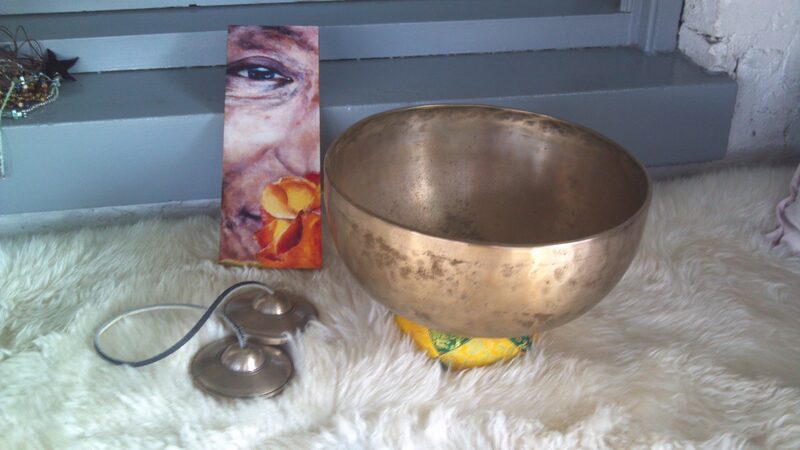 So, when you shop for a singing bowl you sample the sounds and choose the bowl that created sensations you uniquely enjoy. 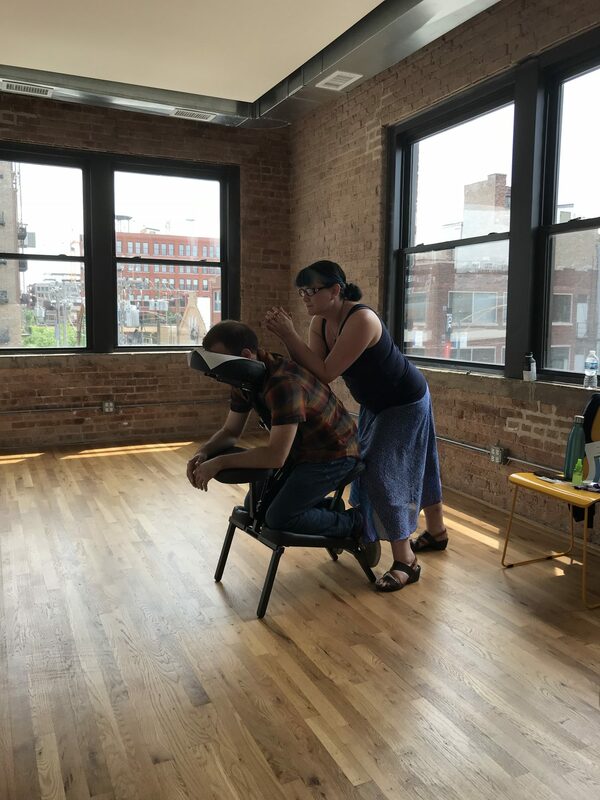 Clients who visit my studio in West Lake View, Chicago, get to experience the singing bowl if they like: lying prone on the massage table, the bowl placed on the back behind the heart, our session concludes with song. “I get a lot of good and different types of bodywork but yours was exceptional and unlike any other.” I hear this both from my corporate clients and my private clients. I remain fully aware that I’m not everyone’s favorite, but this is one of my favorite compliments. When asked why my bodywork is different I first respond with “thank you”. I surmise that it could be 20 years of meditation practice that helps me notice the subtlest sensations in my own body, allowing me to perceive my client’s energetic and physical boundaries. A massage that feels like “too much” may not be because it hurts but because it’s too close, causing discomfort much like a person who invades your personal space. I honor one’s boundaries. I have a huge network of family, friends, bodywork peers, and business owners who are resources for just about everything I need while swimming though and sharing this space and time in life. My meditation practice definitely informs how I am in the world the most, that and my parents.